I’m always on the lookout for good Lovecraft-inspired horror, and so when I stumbled upon the description of Daryl Gregory’s new novel Harrison Squared I just knew I had to check it out. When Harrison Harrison (nicknamed Harrison Squared by his scientist mother, because geek humor is the best kind of humor) was a toddler, his family’s boat was capsized by a giant tentacled sea monster. Officially, the authorities said that it was a sharp piece of metal that claimed Harrison’s leg, and that the storm was what drowned his father, but Harrison knew he did not imagine or hallucinate what he saw that terrible day. Now sixteen years old, he travels cross-country with his mother to Dunnsmouth, Massachusetts, a quiet seaside town where everything seems creepy as hell. His school is like a labyrinth out of myth, the teachers don’t seem to care whether he shows up to his classes or not, and the other students are like the Children of the Corn. The first night in town, his favorite comic book gets stolen by some weird fish-boy. Then tragedy hits when Harrison’s marine biologist mom goes missing at sea. Refusing to believe she’s dead, Harrison goes investigating. Pretty soon he’s gathered about him a group of unlikely allies to battle the nightmarish Scrimshander, an ancient Dunnsmouth legend come to life. Why do I love the Lovecraftian subgenre so? For the atmosphere, of course. As a setting, Dunnsmouth perfectly embodies the rural, insular feel of Lovecraft country, belying the terrible secrets kept under wraps by its townsfolk. The horror featured in these stories tend to involve cosmicism and the occult, which is psychologically so much more effective. Daryl Gregory delivers all these aspects, combining both fantasy and horror elements in a neat little package. There’s no small amount of weirdness in the plot, which is usually something I can’t tolerate, but Gregory somehow renders it into a conceivable, real-world everyday kind of weird that his protagonist Harrison takes in stride…so I did as well. The book will also do well with both adults and teens, striking the perfect balance for crossover appeal. 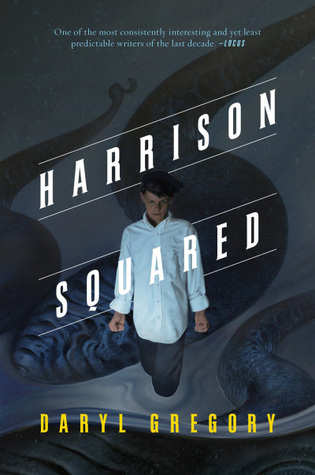 On the surface, Harrison seems to be like a lot of other kids his age, struggling with a volatile temper and his desire to fit in at a new school. But gradually, the reader will learn that he’s also not your typical teenager. Harrison is very well written and convincing; his quiet resourcefulness both charmed and intrigued me, and I sympathized with his fear of the ocean and felt for him when his mom was reported lost at sea. So much of his life has been shaped by the boating accident when he was three years old, and unraveling the mysteries behind his character ended up being as much fun as keeping up with the story itself. Gregory also rounds out the cast with several fantastic secondary characters, including Lydia, a fellow classmate from school; Lub, the half-human-half-fish boy; and last but not least, the most memorable of all for me was Harrison’s Aunt Selena who arrives in Dunnsmouth from New York City to take care of Harrison after his mom goes missing. Breezing into town in a flurry of silks and designer clothes, Sel was not at all what I expected, but it sure made me wish I had more relatives like her. I had a great time with this book. It’s not a heart-pounding tale of horror, but rather a well-paced delectable mystery that’s also a fun adventure filled with lots of unexpected twists and turns, while exuding an eerie vibe. I enjoyed uncovering the secrets of Dunnsmouth with Harrison and his strange but really cool group of friends, and hopefully there will be some sort of follow-up to this book and that we won’t have long to wait for it. A review copy of this book was provided to me by the publisher via NetGalley in exchange for an honest review. My thanks to Tor Books! Have you read We Are All Completely Fine? Harrison Squared is the prequel. It’s about a psychiatric support group for victims of paranormal incidents. Harrison Harrison is in it, but older, and the overt Lovecraft allusions are toned down, but it’s got that Lovecraft weird vibe and is genuinely creepy. I LOVED We Are All Completely Fine, Michael. It was completely different from this one. Much darker and it didn’t have the humor. But still amazing. Yep, I picked it right up after I was approved for Harrison Squared and read it after this one. The style is so different, I was amazed! I really liked it though, my review of WAACP will be up Sunday. Ah yes I saw the book but I wasn’t sure it would be for me so I didn’t ask for it but now with your review I wonder if I didn’t make a mistake because it sounds good and with so many things in it! Maybe one day. thanks for the review! I’ve had that happen sometimes. I almost let this one go by, I didn’t know anything about it! But the description sounded like something I’d enjoy and I took a chance which paid off. Oh, interesting. I’m still a bit undecided if I want to try this one, but I am definitely more interested now. I love how you describe Harrison, it makes me want to know more about him, what sets him apart from the typical teenager. Also that town sounds incredibly creepy, which is always a plus! For you, I definitely recommend We Are All Completely Fine, which should be right up your alley! If you like that one though, you must pick this one up too, I think it gives so much insight into Harrison’s character! I think if I had read this one after We Are All Completely Fine, the YA vibe would have totally won out too 😛 I don’t know if I found it funny in the same sense you did, but it had its moments of humor for sure. I loved Aunt Sel! And I’m with you, I am currently on the holds list for Afterparty at my library now. I want to read more by Gregory too!